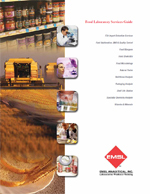 Description EMSL Analytical, Inc. can analyze multiple matrices for specific food allergens: Food & Beverages, Environmental Surface Samples, and Air Samples (specialized allergen sampling cassettes available). EMSL uses sensitive ELISA based technology and can detect residues down to a ppm level. Rush TAT options available.